1. Set a strategic future vision for the consultant experience using prioritized hero moments that enable the client to later identify, prioritize, and deliver capabilities. 2. Determine the future state experience of the consultant journey, with a focus on how they onboard new clients, so consultants can enable the ideal client experience. This guide was to support the conversations Idea Couture led with client stakeholders during 1-hour long interviews. 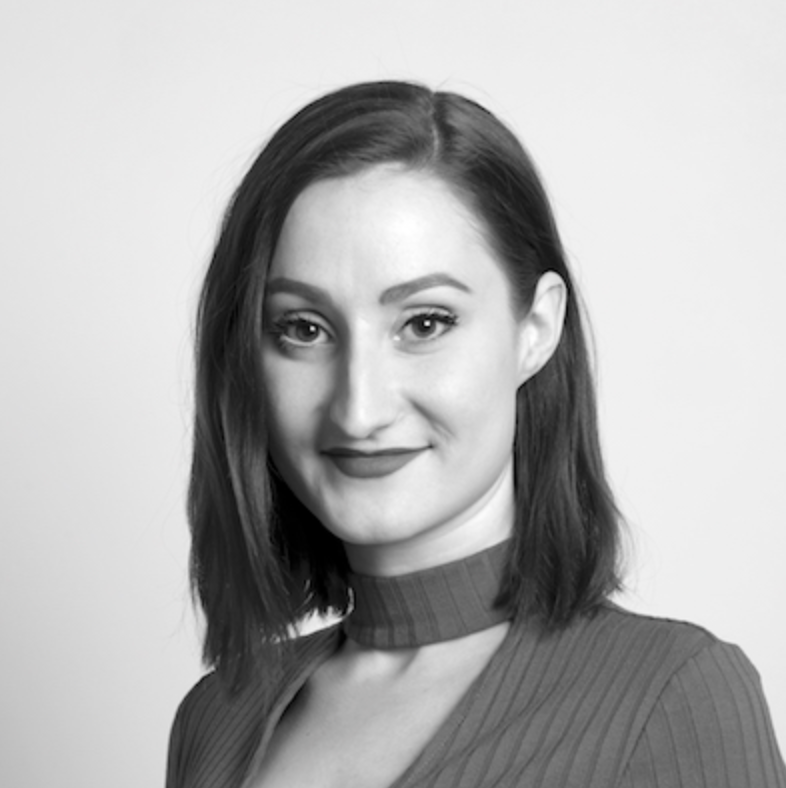 The output of these interviews informed Idea Couture’s understanding of the client's strategy, the current state consultant experience, as well as aspirations for the future state. Background & Role: To understand the role of the stakeholder and their team in the organization. The Role of Consultants: To understand the relationship between the client and its consultants. 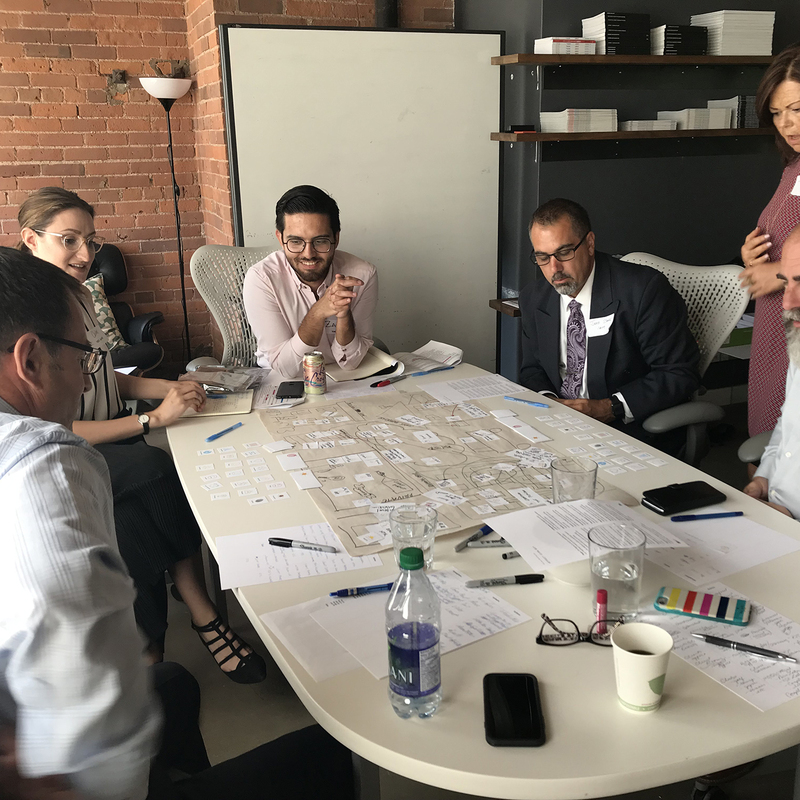 Unpacking The Current Experience: To understand how the stakeholder and their team shape the current consultant experience directly and indirectly, the constraints they work within, as well as their perspective on consultant pain points and desires. Shaping the Future Consultant Experience: To explore hypotheses and visions for the future consultant experience, and the stakeholder team’s role in realizing that vision. We performed a rapid interaction scan to seek inspiration for the client-onboarding advisor experience digital interactions. It pulled inspiration from both the financial services space and in non-traditional comparative industries. Focus: Identify key actors and assess opportunities to enhance the future client journey and onboarding experience from the consultant’s point of view. Purpose: Enable the experience design team to assess and recommend improvements to the client journey and onboarding experience through digital capabilities built for consultants. Significance: Guide the client to strengthen and differentiate the consultant experience in a way that builds relevance for the brand through an enhanced experience for clients, consultants, and their teams. Explore the ways in which consultants perceive their actions, thoughts, and feelings regarding their current client onboarding experience and journey. 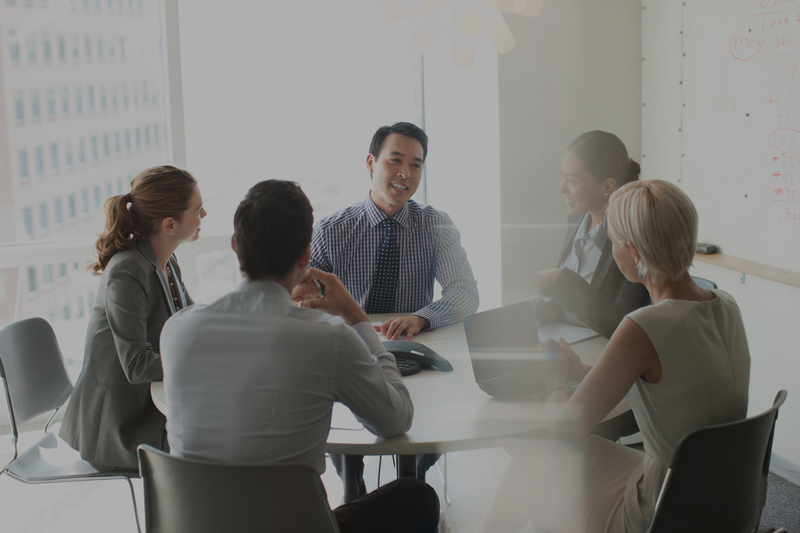 Develop a shared understanding of why consultants act, think, and feel the ways they do about their current client onboarding experience and journey. Imagine how and in what ways consultants perceive and desire to interact with clients and the organization in the future. Develop a shared understanding of why consultants will desire to interact with clients and the organization in these ways in the future. The following archetypes were uncovered during research and describe the key actors who support consultants. It is important to consider these supporting actors to identify the gaps in how they support consultants today and the vision for the ideal future consultant experience. The Ambitious Assistant/Associate: Needs to complete day-to-day tasks efficiently and without errors so they can focus on learning about planning from consultants. The Prudent Field Manager: Needs to raise internal and external perception of the brand through tangible and trackable improvements to the ways consultants work. The Esteemed Specialist: Needs to grow and apply their unique knowledge and skills through proactive planning and collaboration with consultants to benefit clients. The Reliable Client Services Representative: Needs to use practical systems for processing transactions so they can be dedicated to solving complex problems and developing specialized knowledge to offer to consultants. 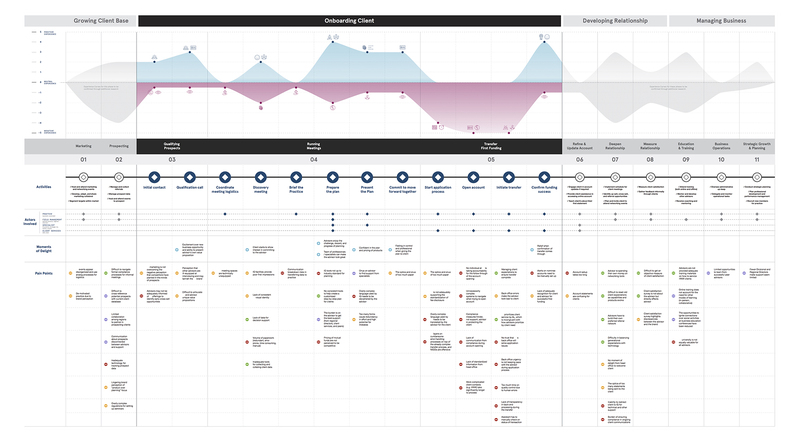 The current state journey map is the representation of the consultant journey from their standpoint. It is a tool for understanding the state of affairs through the identification of interactions between journey actors, places, and artifacts, as well as perceived pain points and moments of delight. Through co-creative research with consultants to identify their needs and desires — including a deep dive on onboarding — opportunity areas were uncovered to help focus on impactful concept development. Upscale the Brand: Construct a differentiated brand experience that emboldens consultants to attract and retain clients. Me Powered by The Organization: Bolster consultants’ personalized value propositions by putting the right people and support systems behind them. Weave Us Together: Enable more meaningful and frictionless interactions during potential moments of contact and collaboration between consultants and their (prospective) clients. Network Knowledge: Bridge connections for consultants to people, networks, and knowledge assets across the organization and beyond. 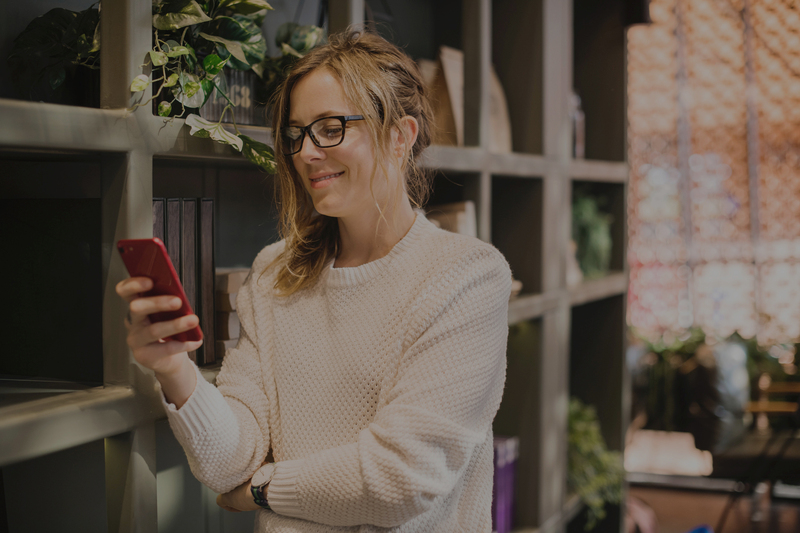 Edible Information: Package consultant communications and tools with thoughtful consideration to how people engage today in an era of increasing notification noise. 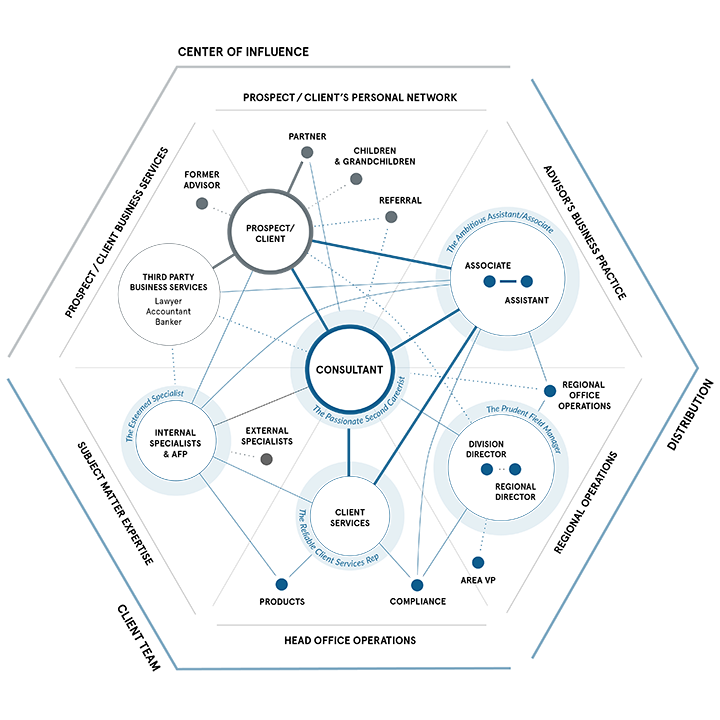 The future ideal state advisor journey map illustrates the experience of the Group Powered Consultant once the strategic vision has been realized. Built to address current state unmet needs uncovered through research with consultants, the journey map identifies key opportunity areas, visualized through hero concepts and alternative concepts. These concepts can be woven together to tell various stories about how the organization can aid consultants in servicing clients. 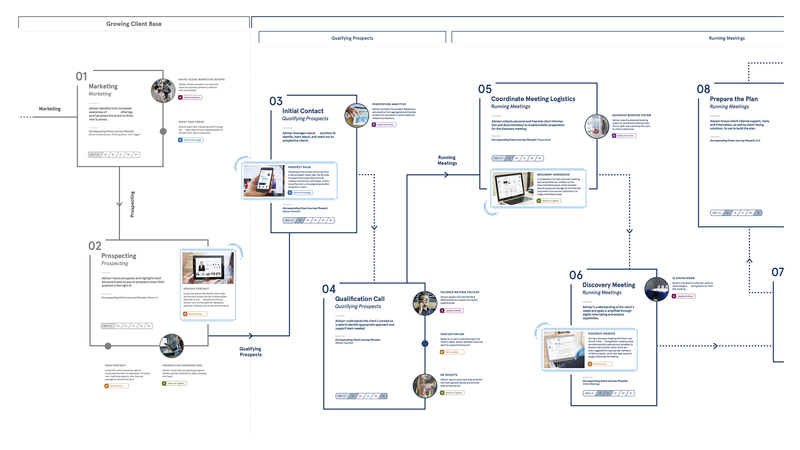 The future state journey map contains 30 concepts for improving the consultant experience tied to the opportunity areas. We prioritized and visualized 8 hero concepts that targeted pain points or added moments of delight within the ideal consultant experience of onboarding a new client. Here are some samples of a few of those hero concepts. An online visual identity for consultants with a humanized touch. 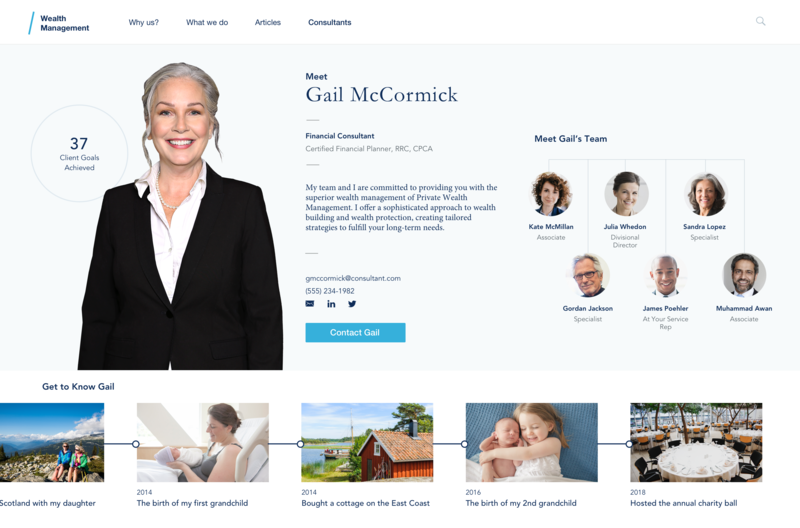 Consultants can craft online portraits of themselves to showcase their personal brand. Consultants are able to demonstrate parts of themselves online that prospective clients do not get exposed to early on, beyond the consultant’s financial certifications and designations. An advanced speech-to-text note taking tool that turns insights into actions. 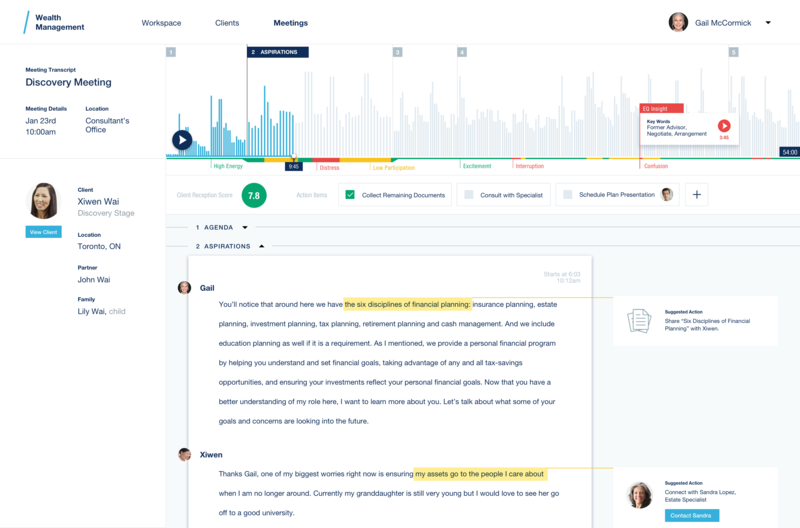 Dialogue Insights is an advanced note-taking tool that captures speech-to- text and organizes notes through triggered keywords. 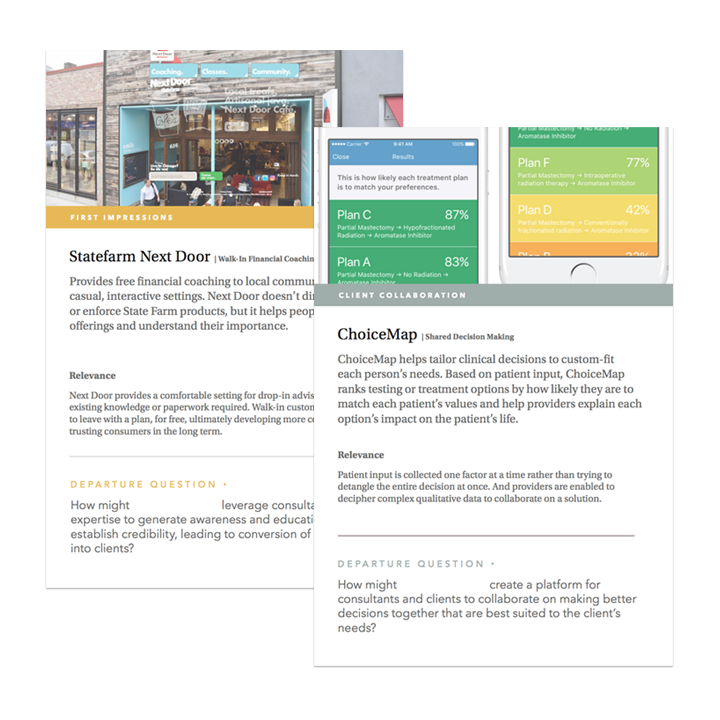 Notes are automatically synthesized into action items, which are assigned to team members in the practice. Emotional analysis of the conversation provides insights into not just what was said but how the speaker said it. Online and in-person knowledge sharing communities across the organization. 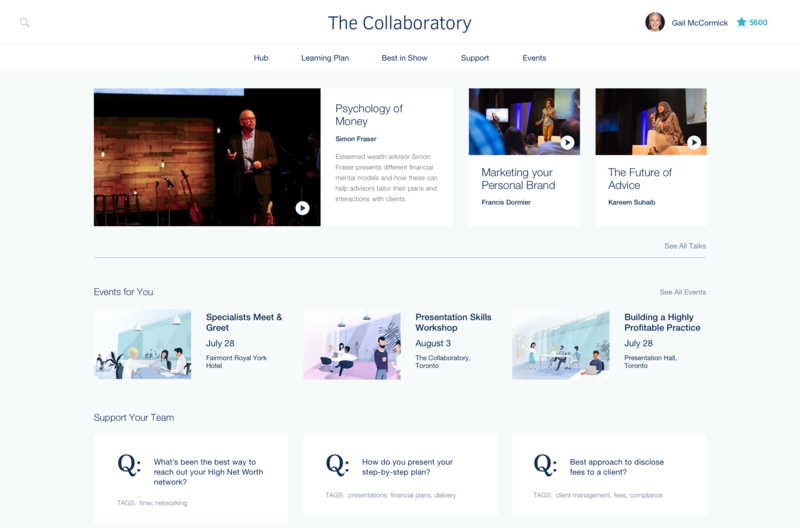 The Knowledge Collaboratory is both an online platform and physical space for consultants and experts across regions and specialty areas to share best practices, engage in discussion threads, and participate in upcoming in-person events. This provides opportunities for professional development, collegial connection, and collaboration on ways to better serve clients — especially in complex cases. "A valuable and enlightening experience"